MOSCOW. Feb 14 (Interfax) – The Moscow mayor’s office has granted the request made by Solidarnost seeking authorization of a memorial march for politician Boris Nemtsov on February 25, Ilya Yashin, a member of the movement, told Interfax on Wednesday. “The mayor’s office granted our request and authorized the route from the Stastnoy Boulevard along the boulevards to Prospekt Sakharova,” Yashin said. The participants will meet on Strastnoy Boulevard at 1:00 p.m., he said. The event will have up to 30,000 participants, he said. The negotiations with the Moscow mayor’s office were “fast and constructive,” he said. “We are satisfied with the negotiations and their outcome,” Yashin said. The press service for the Moscow department of security and corruption prevention confirmed to Interfax the authorization of the mass event in the format of a demonstration on that route. Nemtsov, an opposition politician, was killed on the Bolshoi Moskvoretsky Bridge near the Kremlin on February 27, 2015. 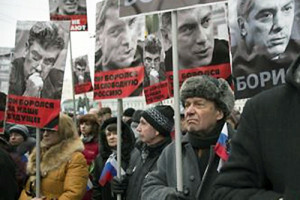 His associates hold a memorial march in central Moscow every year.